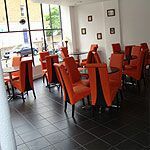 Jay Restaurant can be found within Tommy Miahs Raj Hotel on Essex Road. It serves traditional Indian meals within modern surroundings. Do you work at Jay Restaurant? What did you think of Jay Restaurant?